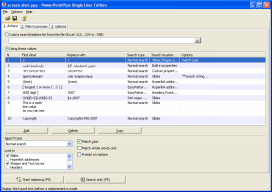 Search and Replace for Microsoft PowerPoint takes ALL the hard work out of replacing text across multiple Microsoft? PowerPoint? presentations. Just imagine - next time your organization changes its phone number, address, web site or CEO - just run Search and Replace for Microsoft PowerPoint across your file server or website to fix all affected presentations in one hit. Translators can use Search and Replace for Microsoft PowerPoint's grid to define multiple search/replace pairs. You can also run Search and Replace for Microsoft PowerPoint in search-only mode to locate documents needing manual change. Multi-user, Site and Enterprise licenses are also available to enhance the efficiency of your entire team.